Overall, there are 1,356 colleges and universities that offer a social work degree at all levels. The most popular degree is the Bachelors of Social Work, with 774 total programs. There are 327 Master of Social Work degrees, 176 Associate of Social Work programs. There are also numerous Doctoral level (DSW and Ph.D.) programs, which are terminal social work degrees, offered at schools across the United States. Welcome to Social Work Degrees, the most comprehensive resource for exploring colleges and universities offering a degree in Social Work. All degree levels are covered - Undergraduate and Graduate, and every university in the United States is listed in our database (if there is one missing please let us know!). We use the United States Department of Labor and US Census Bureau, as well as the Council on Social Work Education (CSWE) as our data sources to aggregate all of the social work programs and pertinent information for working in the social work field. One of the more popular degrees in social work is the Master of Social Work, and for good reason. In order to become a Licensed Clinical Social Worker (LCSW) or a Licensed Master Social Worker (LMSW), you must have your Masters degree in Social Work. This is one of many reasons universities are beginning to take their MSW program online. Choosing the right professional field can be exciting and even evoke some feelings of uneasiness. After all, a degree will provide assurance of security for employment in the future. It is the source of livelihood for families and can potentially make or break a career. Students that are interested in the field of social work should take note of the various requirements of this field and the potential career opportunities in order to ensure that this field fulfills their professional desires. There are numerous organizations that are available for support and information and numerous references for those interested in the scope of work for this field. There are many different types of social work degrees, and you can view the write-up of dozens of them by clicking here. Where Can I Find a Social Work Program? Across the United States, there are currently 1,356 colleges offering degrees in social work. Prospective students should rest assured in knowing that there are ample sources of support for upcoming students that are interested in making the right decisions for a great degree program. Taking a look at the social work field, it is seemingly an excellent field for individuals with the drive to help others and solve problems for families searching for relief. Why Social Work? Deciding to pursue a degree in social work is a breath of fresh air for students looking for an in-need career. Society is a diverse and unpredictable phenomenon. People run into struggles and yearn for help with personal and financial problems. Why Do We Need Social Workers? Social workers are needed to ensure that families and individuals alike – of all economic, social, or ethnic standing – are served with dignity and to the highest standing. Social workers help kids and adults, and are needed in every city. Below, you will find the top resources for finding a social work degree. Start here for navigating programs and figuring out which social work degree or career path is best for you. What Concentrations Are There for Social Work? Social work in a unique and interesting career field. It can be challenging yet extremely rewarding, and simply stated – it is not for everyone. Social work calls upon the most caring and compassionate professionals to lend a helping hand to those in need. There is a widespread need for social workers in order to assist with a variety of different callings in fields the deal directly with the public and the public need. Social work at its core is the direction and leadership of people within a community towards a better purpose. Upcoming professionals that show an interest in this field are a vital asset to the communities in which they live. There are currently 774 universities providing Bachelor’s of Social Work degrees throughout the country. Of these 774, 511 are accredited by the Council on Social Work Education. Choosing an accredited college provides learners with a sense of relief in knowing that their degree will be accepted for future licensure. Bachelor of Social Work degree programs can be obtained through traditional in-person colleges as well as online platforms. Online learning is becoming more popular as the years progress, making this a great option for busy professionals wanting something extra for their professional life. The widespread availability of degree programs can potentially open doors for students from all backgrounds. One of the most common degree paths for social work is at the bachelor’s level. The Bachelor’s degree program in Social Work really dives deep into social behavior and public service – pulling together the various aspects of both that draw them together. These 4-year programs are suitable for individuals that wish to build a foundation in social work and potentially move to higher degree programs in the future. While in a bachelor’s program at this level, students will be taught the skills required to work with the public. Community planning, social welfare and relationships to the judicial system, mental health topics, and administrative functions are taught in depth throughout this program. Students will learn about the various functions of social service agencies and how their contributions will lead to better lives for individuals throughout their career. The schematics of local and government agencies are also taught in the bachelor’s program, which can prepare learners for careers working for state or government agencies. The knowledge gained throughout these programs can provide a solid platform of social skills that can contribute to a meaningful career for those involved. Wondering what can be done with a Bachelor’s Degree in Social Work is completely normal when considering this degree program. A degree can be a means for a better life, so considerations for future potential should always be a part of the decision process. It is always important to consider how much a degree can provide not only financially, but also with regards to quality of work. Licensing for social workers can be obtained at the bachelor’s level in some states, but most states require master’s degrees or higher in order to be licensed through the state. It is important for applicants to review their state’s current standards prior to choosing the right degree path. At the bachelor’s level, graduates have the potential to seek out careers in many different fields in the social domain. Careers are available as mental health assistants – providing care and planning for individuals under the care of licensed mental health practitioners. Bachelor’s level social workers can also work for welfare agencies providing case planning and outreach for families receiving food and healthcare assistance from their respective states. Youth care facilities that foster troubled youth also seek out social work professionals to fill positions such as activities coordinators and youth service officers. Various positions in community planning and administration also rely on knowledgeable social work professionals to fill their positions. Throughout the country, 327 colleges offer Master’s in Social Work programs. 249 of these programs are CSWE accredited, so it is vital to review each program prior to applying. A master’s program is designed to train practicing professionals in order to create more knowledgeable and experienced social workers in the field. Pursuing a master’s degree in social work is a proud and exciting quest. The Master’s degree in Social Work opens learners up to the potential for licensing as well as more employment capabilities throughout a career. What a master’s degree means for upcoming students is a more in-depth look into the social work field and the opportunity to work hands on with the public during typical course studies. Master’s programs integrate the social knowledge gained in undergraduate studies with the application of theories and practices in an in-person setting. 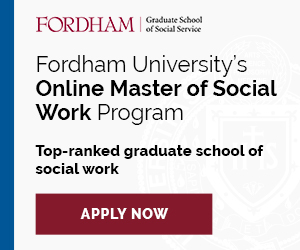 Master’s Degrees in Social Work are also available through online universities, making it a convenient choice for individuals that have families or current careers to maintain. Online learning allows students to embark on independent learning and time management, which are important skills for social work professionals. Regardless of whether or not students to choose to pursue this degree in traditional environments or online, accreditation ensures that the curriculum is on point and accepted by future employers. Typical Master’s degree in Social Work programs last about 2 years and require students to take part in an on-the-job practicum near the end. Depending on the university, students can choose either a clinical or non-clinical focus, which can change the scope of their class work as well as the requirements for the practicum. Students also have the potential to choose a specialty at this level. Depending on personal preferences, one specialty may be more fitting for some than others. Regardless of which path is chosen, the curriculum within the master’s program is fitting for the most dedicated professionals. Although obtaining a Master’s degree or higher in Social Work is an amazing achievement, it is not the end of the line for those seeking licensure. Social workers work directly with the public, so it is important to understand the professional and ethical concerns associated with positions of such value. Due to the importance of these positions within society, most states place requirements on educational standards, experience, and personal history or applicants requesting licensure. Some states allow bachelor’s level graduates to become licensed upon graduation and completion of an exam and experience requirements, but most begin licensure at the master’s level. Depending on which state a student resides, he or she may be qualified for licensure after only a bachelor’s degree. Researching individual state requirements will ensure that applicants are knowledgeable of what their state requires and prepared for the road to licensure as they move along. One state notes that applicants should have a degree from an accredited university. Master’s level applicants in this state are not required to take part in supervised work experience, but must pass a master’s level exam. Once these steps are completed, graduates are considered licensed to work in the social work field within their state. Micro social work is a classification of social work that considers individuals and small groups as direct clients for practice. This sector of social work can include working with people on a personal setting, helping them to connect with resources in the community that can improve their quality of life. Some common duties of micro social workers may include providing assistance to families that are seeking assistance with food or housing, advocating for juveniles during court proceedings, or working individually with people that have struggles with drug addiction or criminal behavior. Most of the work completed within this area of social work is concerned with the well-being of individual people or families. Macro social work is a field within the social work distinction that focuses more on the broad aspects of the social work field. The laws that regulate social work professionals are often analyzed and implemented by macro social work professionals at this level. This level of social work can also include the review and improvement of current social work policies that dictate services provided by micro and mezzo social workers. Macro social work is typically more concerned with the well-being of society from a broad perspective, rather than focusing on the specific needs of any specific groups. Mezzo social work focuses on the needs of small groups within society. Communities, neighborhoods, educational institutions, and organizations are often the focus of concern for social workers in this field. Mezzo social workers integrate medium-scale planning into their day-to-day activities, which can consist of brainstorming ideas for community improvement, public safety, or client advocacy. Some components within mezzo social work can have a direct effect on individuals throughout society and can also play a role in the integration of macro social work policies implemented at a higher level. The Advanced Generalist Social Work degree program provides a broad outlook on the field of social work. This degree program does not consist of any focus of specialty, but rather the science of social work from an educational viewpoint. This program provides insight into the history and change of current social work programs, as well as the current social work system in society. Generalist social work professionals can gain a well-rounded expertise rather than just learning more about individual areas within this discipline. Social work degree programs in Administrative Leadership were designed to help students gain a better understanding of the administrative, financial, and ethical foundations present within management positions in social work. This program provides courses that can increase student awareness of client care, employee conduct, and budgeting in day-to-day business. Administrative Leadership can help increase students’ skills in communication, team building, and organization so that they can effective lead teams of social workers in a professional setting. This degree is popular for people that have some experience in the field of social work. Adult Needs Social Work is a sector of public health that focuses on the needs of adults that have needs that cannot be satisfied independently. This degree in particular helps to provide social workers with the skills to help adults make important life decisions such as those pertaining to healthcare, finances, and housing. Degree programs that focus on Adult Needs Social Work help students learn more about resources available to individuals within this population, as well as the financial assistance and programs provided through the U.S. Government. Graduates of this degree program can work with hospitals, retirement homes, or with social services. Behavioral Health Social Work degrees are geared towards helping psychological-based learners focus on the environmental and biological components of human behavior. These factors can play a role in determining why individuals act in specific ways and how these behaviors can have an effect on their overall health. Having this degree can help graduates implement strategies for better education, supportive behavioral health agencies, and counseling that can assist in helping people lead healthier lives. This degree can lead to careers in behavior counseling, community health, and research. A degree in Child and Family Social Work consists of a look into the direct needs of children and their families. This degree can help to create effective social workers that can act as advocates for children within a state setting, provide assistance to families with financial needs, or assist during difficult family-oriented crises such as abuse, neglect, or adoption. The curriculum within this degree program is designed to help students understand the physical, emotional, and behavioral needs of individuals within this group. Community Social Work is a mezzo social work program that involve working within a small community. This degree program can include topics such as finance, management, planning, and policy development. There are many laws that govern social work, many of which can help guide professionals throughout their career. This program can help students to find future careers in city planning, leadership, and even local government. Courses within this program can include topics that can assist with effective decision making communication, and personnel management. Community Organization, Planning and Administration is a degree program that focuses more on the hands-on approach to local social work. This program can help students gain skills necessary to effectively plan and lead important community programs centered around social work. Some planning that is included within this degree program can include community health and awareness plans and youth recreation. Choosing this degree program can help you gain expertise in management techniques that can lead to potentially successful career options within the social domain. Programs that focus on Counseling Social Work were created to provide students with expertise in one-on-one engagement with the public. These types of programs focus on the different counseling techniques available for upcoming professionals, and the most useful methods for applying them to the public. Special topics such as substance abuse, youth studies, and marriage counseling may be a part of the curriculum in this program. This type of degree can lead to future licensure for graduating students, as well as careers working in counseling for the general public. Clinical Social Work is a practical application of social work for mental health or medical needs. The degree program for Clinical Social Work may include clinical components that can help students learn about proper treatment methods, available pharmaceuticals, and treatment evaluation and planning for patients in need. Students that complete this degree program can become licensed at Licensed Clinical Social Workers within their state and practice with the public. Social workers at this level can provide counseling services for individuals and groups within many different fields in society. Students that want to work on a personal level with clients may be best suited for the Direct Practice Social Work degree. This program is designed to help strengthen communication skills, advocacy skills, and knowledge within social service agencies and provisions. Students earning this degree are expected to maintain a close and professional relationship with clients to ensure that they are in contact with needed services and receiving the right type of care. Most graduates in this field maintain a case load of clients that require close monitoring and attention. Agencies that call upon social workers in this field may include social services, healthcare social work, and mental health services. This degree program is an excellent choice for students that want to provide assistance to gerontological patients in a clinical setting. The purpose of this degree program is to educate students on the topics needed to help aging patients maintain stable financial wellness, make important healthcare decisions, and monitor the progress of relevant treatment plans. The curriculum in this program may include topics such as developmental health and wellness, adult care law, and social work systems for the aging population. Students that pursue this degree may find careers working for retirement homes, hospitals, or even in private practice. Mental Health Social Work degree programs integrate curricula from both Social Work and Psychology. These programs are based around the needs of individuals that have been diagnosed with mental health disorders and illnesses. Throughout the educational program, students can learn about the different responsibilities of social workers within this domain, as well as the different psychological disorders and services that are present within society. The result of this type of degree program can be careers working for mental health agencies, hospitals, or even patient advocacy centers. Students that earn this degree may even have the option of working for patients that are not clinically able to make their own financial or medical decisions. Trauma Social Work is a specialized degree program that focuses on services for individuals that have experienced serious trauma within their every day lives. During the program, students can learn the different types of trauma and how these traumas can change the human brain. Counseling techniques, resources, and services provided to trauma victims may also be a topic of discussion throughout this course. Social workers that focus on Trauma Social Work can work for agencies that provide intervention during child abuse, domestic abuse, and even recovery services. This degree program is an excellent choice for individuals that are interested in the well-being of youth and their families. Working with clients to find resources, counseling, and services is a primary goal of this field – specifically for children and family members. In this degree program, students can learn about the different laws and regulations that govern work with youth, services provided by state and local governments, and laws regarding children and families. Once completing this degree program, students can work for social service agencies, schools, or even in private practice. Accreditation is a label that is affixed to degree programs that are approved by higher learning organizations. For social workers, an important organization to remember is the Council on Social Work Education. This organization is the highest accrediting board for social work educational programs. When seeking out potential degree programs, it is extremely important to determine whether or not the chosen program has been accredited by this organization. Accreditation of these programs provides learners with the assurance that the degree program is relevant and covers everything needed for a fruitful and ethical career. Degree programs that are not accredited by the CSWE may not be accepted by certain states with an application for licensure and even some employers. Putting heart into a degree program is something that will pay learners off for a lifetime. It is worth the extra time to ensure that the degree programs available provide the same worth in the end. SocialWorkCAS is a unique featured created by the CSWE that enables students to discover and apply to schools through the same platform. Schools are also able to communicate through this platform. Licensed clinical social workers are found within many different areas of the community. In schools, social workers can provide educational reference and advice to students as well as working as advocates for children in need of guidance. Some social workers work for state agencies and maintain contact with educational institutions in an attempt to find more effective methods of providing education and support to students. Social workers at this level can also pursue meaningful careers working with welfare agencies in an attempt to help families find better means of employment, medical or mental health services and even legal assistance. Master’s level social workers act as a third party in connecting community members to the services that they need. Hospitals work with social workers to find outside resources for their patients as well as support groups and medical insurance providers. Social workers act as advocates for children and the elderly in situations that require intervention and potential home placements. In the mental health field, social workers are an important part of maintaining a proper treatment program, both inside and outside of the home. Being a master’s level social worker provides the opportunity to make a difference in the lives of people from all walks of life. Learn more about LCSW careers here. Choosing social work as a degree path is a step in life that can potentially lead to better careers, more enjoyment and career fulfillment. There is definitely a sense of pride in knowing that this degree program provide so much for communities and the residents within. However, with the high number of available online and in-person degree programs, it is important to consider what accreditation means not only for a degree program, but for licensure and potential careers in the future.